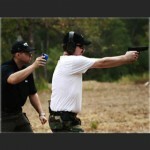 Tactical-Combat Handgun Training in Dallas, TX. Take Your Handgun Skills To a Whole Other Level. This course takes our Defensive Handgun Course and moves you to the point of being a true professional, capable of handling yourself in any shooting situation. This tactical-combat handgun course will transform your handgun skills in every way. * Learn to draw and shoot — with speed and accuracy — in a wide variety of tactical and defensive scenarios, so that you can be confident yours will be the first (and only) shots fired if you or your family are put in danger. * Learn to shoot multiple targets, at various ranges, heights, and intervals, making use of our innovative steel target configurations. * Learn to fire your handgun, not only from a combat stance, but accurately one-handed, both with your strong hand and your weak hand, including simulated injured-hand scenarios. * Learn to move and shoot, while advancing and withdrawing, and while executing tactical reloads and maneuvering between a variety of cover-and-concealment barricades. * Learn to clear a house — your house — in the event of a home intrusion. * Learn to end a hostage situation or attempted car-hijacking — in under five seconds. * And while you are at it … have the coolest and most exciting day you can imagine! Here at Big Boar Tactical you have the option of everything from a 2-hour introductory tactical handgun course to a 4-hour more comprehensive tactical handgun course to a full-on, all-day, 8-hour tactical handgun training course that will push you to your max. You can learn most of the core skills in the 2-hour course, and we will train you on how to continue to drill and practice. But we recommend if at all possible signing up for the 4-hour course, because you will not only learn additional skills but also have more time to really practice and drill on everything mostly means more shooting, more drilling, with a wider range of you are learning. Going for the full-day version of the course (or signing up for two 4-hour blocks) means … more shooting … a lot more shooting … and will really allow you to come away from the training feeling that you have moved your skills to a whole new level. If all you are doing with your gun is shooting a bunch of paper targets right now, you are NOT ready to handle yourself in a situation where there are lives at risk. Take responsibility for your own safety. 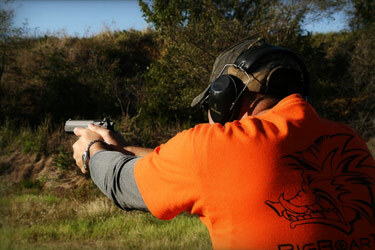 Learn to handle your handgun with more confidence than you have ever known or experienced. And learn to shoot like a professional. And it’s simple to sign up. Just give us a call today at 972-787-9978 or CLICK HERE to request more information on the most comprehensive Tactical Handgun Course available in the Dallas and Fort Worth, TX area. CLICK HERE to request more info on our Tactical – Combat Handgun Course! I am looking for tactical handgun classes. Do you have discounting for American Airlines pilots? I have a 15 year old son who has done extensive pistol and carbine shooting in a controlled instructor environment including drills under duress. The facility where we did this father/son training was closed several months ago. Can you make accommodations for a very mature, highly skilled, and highly coachable “yes sir”/”no sir” young man to keep his skills fresh? Hello Tim.. I was sure I had replied to you a LONG time ago and in looking over this I can’t see it. YES, we surely CAN help you and would love to. PLease let me know if you got this? Then we can discuss further options and use MY email address as these get LOST in an ADMIn acct sometimes.